The finance function continues to evolve and improve in response to the availability of new tools and technologies like RPA and AI, and corresponding changes in roles and responsibilities. APQC has spoken with numerous organizations of late in the process of investigating or implementing digital technologies, for example. While most employees desire to continuously learn and improve their processes, change due to the adoption of new tools and technologies (or due to any other kind of reason, like a change in organization structure) can involve a lot of uncertainty and sometimes fear. Finance leadership that desire to make any kind of major change in an organization – be it cultural, service delivery, process changes, changes to roles and responsibilities, and/or the adoption of new technologies – should think through the following five aspects of robust change management in order to help facilitate a smoother transition, increase engagement, and increase the likelihood of the change sustaining over time. 1. Leadership support and role modeling: One of the most important levers to ensure whether or not major change initiatives succeed or fail in the finance function is the support and role modeling of an organization’s senior leadership. Leaders serve as key change agents in the organization, and organizations serious about change will first think through how to engage their senior leadership team in the transition. For example, according to a recent “Managing the Change Gap” survey from APQC, the majority (83%) of survey participants said that they leverage senior leadership in the change, typically for strategic communication on what the change means and high-level guidance on ways employees can change. Similarly, 86% of survey participants said that they leverage middle management in their change efforts, predominantly through an active, tactical role in change efforts, guiding staff through the change, and helping staff adopt new behaviors. And don’t forget to provide leaders with the resources they need to lead the change, such as talking points and conversations guides, as well as training on new behaviors. 2. Robust communication planning: Similarly, a robust communication plan is an important, and often underestimated, part of successful finance change initiatives. The communications plan should include a range of potential communication channels, ranging from in-person messages by leaders and line managers to e-mail and videos, aligned to the preferences and priorities of different stakeholder groups. Often stakeholder analysis is conducted to help articulate all the different stakeholders impacted by the change, the particular messaging options targeted to these stakeholders, as well as the venue, timing, and cadence of communications. APQC’s research has found that, to effectively communicate with employees, managers need to personalize their messages and devote ample time to listening. 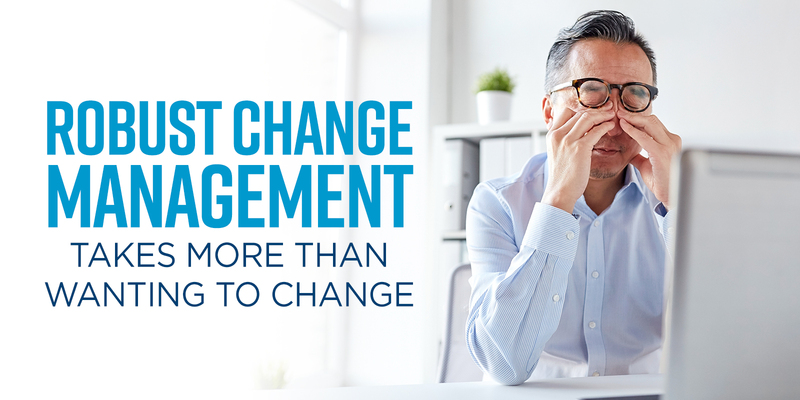 Employees are more likely to embrace change when they understand how the change will benefit them and when they feel their concerns have been addressed. And communications should not necessarily stop once the change has been implemented. 3. Employee engagement and involvement: It has been said that users buy into what they help create. Oddly, sometimes finance functions roll out major changes without any kind of user involvement, input, or validation, and think that it is going to go well, and when it doesn’t are surprised by this. Organizations should think through engaging employees in planning the change as opposed to during or after the change. Engaging employees while identifying or planning the change gives employees a sense of ownership which helps to improve buy-in. Engaging employees during or after the change is implemented can result in higher levels of resistance because the employees feel the change is something happening to them rather than with them. Best practice organizations engage employees in the change through communications and training, yes, but also by soliciting their feedback and showing them how the change benefits their work. For example, our own organization recently implemented a cloud-based collaboration, teaming, and project management tool. As part of this change, the organization engaged power users from each department to explore the new technology, train on the new technology, and heavily engage them in the roll out and training of the rest of the organization in the new technology. 4. Training: A critical success factor to sustainable change initiatives in finance is training – employees need to be trained on the new process and expected behaviors. More than half (55%) of organizations responding to APQC’s recent Measuring the Change Gap survey train employees on the change and how to make the change. Best practice organizations provide ongoing employee training to reinforce the new culture, behaviors, and necessary skills. For example, as part of its finance transformation, global container shipper Maersk centralized its finance transactions to benefit from increased efficiencies and so that finance business partners can focus on frontline support. As the revised business partner framework was established, the company established a large-scale training program to help finance business partners develop new competencies. The training details the finance business partner role, value drivers, responsibilities, and how to deploy these competencies. Training is supported by a model of 12 competencies broken down into the categories of partnering, analytical, leadership, and technical skills. Each partner is assessed based on their maturity level in each competency, and Maersk focuses on the two to three core competencies to develop through formal training and six months of face-to-face coaching. Three days of formal training include a real-world case study to solve using the aforementioned SCQ framework. Participants then write a paper reflecting on their learning experience. In its first year, 400 finance business partners participated in this program. 5. Rewards and recognition: Finally, best-practice organizations use some reward system to reinforce the adoption of new behaviors by their employees. The most common practices are the use of new behaviors as key performance indicators (KPIs) in performance reviews and through public recognition. Best-practice organizations also factor in the use of new behaviors in promotions. In conclusion, as finance functions continue to evolve and digitalize, robust and holistic change management is increasing important to effect and sustain the desired change. Whether undergoing changes in organizational structure, service delivery, process changes, or technology changes, finance leaders should partner with senior leadership and their HR/OD resources to incorporate these elements of change management in order to ensure successful adoption and sustainment of the change. For more information on the top priorities and trends for financial management in 2019, including new planned investments in tools and technologies, visit APQC’s recent webinar on What’s Driving the 2019 Finance Agenda?